New John Deere tractor, sprayer and precision farming technology will be featured at November’s The CropTec Show in Peterborough, with the focus on machine, system and operator connectivity leading to increased efficiency and reduced operating costs. John Deere’s new 6250R tractor, featuring the award-winning CommandPRO joystick and an AutoPowr transmission, will be operated with a 5200-litre capacity R952i trailed sprayer equipped with the innovative PowrSpray wet system in the event’s outdoor demonstration area. The 6250R develops up to 300hp with Intelligent Power Management and is fitted as standard with JDLink telematics, including remote display access (RDA) and wireless data transfer (WDT) linked to the MyJohnDeere.com website portal. PowrSpray features a unique dual-circuit design with two solution pumps, each optimised for a specific function. A 1200-litre/min filling pump offers fast fill of the solution tank at low engine speeds, to reduce noise and fuel consumption. Automatic filling shut-off and the ability to rapidly power fill the 400-litre clean water tank are both standard features. The industry exclusive Active Pause function enables the solution tank to stop filling while still providing clean water under high pressure for rinsing out chemical containers. This means the typical race against the filling solution tank is eliminated, and operators have all the time and clean water they need to complete chemical filling without stress. A 1000-litre/min spraying pump delivers high output and exceptional spray accuracy. Automatic control of tank agitation and fully automated multi-cycle rinsing and dilution functions are also standard features of PowrSpray. Indoors at the show, the emphasis will be on John Deere’s latest FarmSight services and support, including features such as RDA, WDT and Service Advisor Remote, which are now widely available from John Deere dealer specialists. All of this technology is designed to increase productivity and reduce cost, especially when paired with other FarmSight systems such as AutoTrac automatic steering and Section Control for sprayers and spreaders. 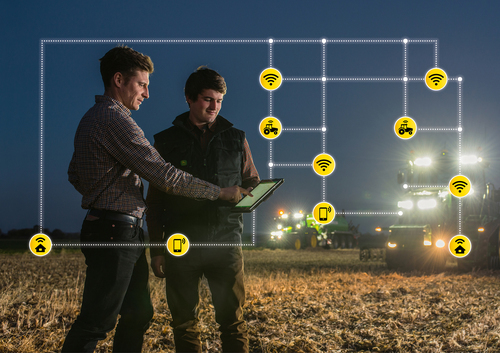 John Deere sees the future of farming in connectivity, making the most of machine, field and agronomist data in the decision making process. The company is pioneering the use of such data based around MyJohnDeere.com and a range of connected machines and systems. The Operations Centre in MyJohnDeere.com serves as the central online location for farmers and contractors to connect to their machines and their fields. It also allows a wide range of partners to provide additional support to customers, including implement manufacturers, agricultural input suppliers, software companies and agricultural service providers such as crop advisors and other specialist consultants. The latest apps make it very easy to keep track of machinery, get advice on seed and fertiliser rates or spray requirements and monitor machine productivity by working together with, and being connected to, the dealer, farm adviser and other suppliers. For example, the new MyJobConnect service includes a MyJobsManager app for farm or fleet managers and contractors, and a MyJobs app for operators. There is also an additional app in the MyJobConnect Premium service called MyLogistics, which is an intelligent ag navigation app. Services can be accessed in two ways, either from the office computer or on-the-go using dedicated apps for tablets and smartphones, which allow drivers to view and carry out tasks in real time from their mobile devices. This latest John Deere connectivity package is designed to free up time for farmers and contractors to focus on their core business, and makes the complete work process including job planning, work orders, data recording, customer invoicing and reporting much easier, faster and more efficient.